also available at: http://parnassusreads.comSo lately I’ve been perusing Clive James’s massive Cultural Amnesia, a browser’s guide to the major thinkers, writers, and cultural icons of the past several hundred years (back as far as Sir Thomas Browne), though most of the personages that fill these pages are from just the past century. At first glance, this book may appear to be friendly to your average reader, one of those books the average reader might pick up to gain a not-so-quick overview of Western thought, or even perhaps just some good talking points for the next cocktail party. Average reader, beware; this book is probably not for you. Even when discussing known figures (Coco Chanel, Jean-Paul Sartre, Michael Mann come to mind), James veers off in completely unexpected directions. Not that this is necessarily bad; Montaigne is famous for this. The difference between Montaigne and James, however, is that Montaigne has a wholly unique and essential way of bringing the reader full circle. James frequently leaves the reader far from where they started.He also frequently leaves the reader with his abhorrence of totalitarianism. This, no matter the subject, inevitably makes its way into almost all of the essays, even the one on Coco Chanel, who he pinions for accepting the protection of a German officer during WWII before hiding out in Switzerland until France saw fit to recognize her as a national treasure. In fact, the essay on Chanel becomes more of an essay about materialism and the economics of war-time Berlin. This is precisely what makes James’s book so fascinating. If you don’t mind getting lost in ideas, following tangents that leave you sometimes far from the place of origin, then this book is a treasure of information: historical, cultural, theoretical. I was so overwhelmed by what I was reading, I started to take notes on some of the essays and created a general reading list of interesting books mentioned in the various essays. These essays are not a starting point for the reader, but rather a focal point. 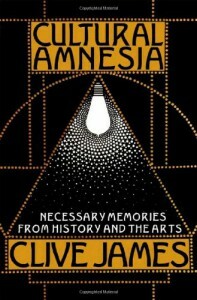 James distills decades of hindsight and perspective through his unique lens and sets the reader on a quest for primary sources, the best thing that can happen for someone like me who loves nothing better than a fat bibliography at the end of an academic article.However, this book is not scholarly in the sense that it’s an academic treatise or historical account: there isn’t even a bibliography at the end (only an index!). Yet reading even one page makes you feel as if you’ve learned something, and usually you have. These essays are the opinions of someone dedicated to exposing the faults of some of the West’s most revered thinkers and icons–but not out of malice. As the title suggests, James wants us to remember the multi-faceted aspects of history and to reject the often easy and convenient narrative of our past, especially when it comes to totalitarianism, fascism, communism, and the ideologies that fueled them.